Ordinance No. 6, Series of 2010 - Ordinance Establishing the Persons with Disability Affairs Office in Vigan. Ordinance No. 07, Series of 2014 - Community Service Ordinance as alternative penalty. Ordinance No. 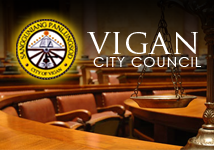 28, Series of 2014 - Ordinance Prohibiting the barring of ramps in Vigan. Ordinance No,11,Series of 2007- Granting 20% discount on medical,dental services & diagnostic. Ordinance No. 5, Series of 2008 - Vigan City Heritage Hearse. Ordinance No.13,Series of 2008 - Establishing Mechanism for Quality public service and transparency, Katulagan. Ordinance No 8,Series of 2003 - Declaring Vigan as a Pro-Life and Pro-Family City.